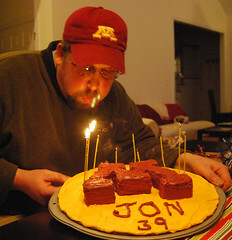 CSP’s parents came over yesterday to celebrate his 39th birthday. 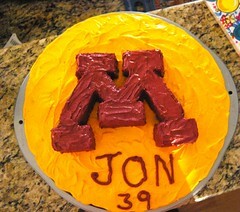 CSP’s Mom made this cake/giant cookie combo in the spirit of the University of Minnesota (CSP’s favorite college football team– they are from MN). His parents made us yummy beer cheese soup & beef stroganoff – CSP’s favorite meal that his parents chef up. The plan was to watch the Minnesota Vikings game on tv but the Metrodome collapsed under the weight of all the snow they’ve been getting lately! 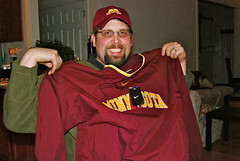 Look how cute my boy is holding up his new Minnesota pullover. I wonder what he’s wishing for? More pics here. Happy Belated Birthday to CSP!